Any gardener can enjoy home-grown herbs and their abundant ornamental and useful qualities. When planted in the conditions they prefer, herbs are easy to grow, and they are simple to harvest and preserve for home use. Whether you have a large plot devoted to herbs, a medium-sized garden in which you intersperse herbs with other plants, or just a window box or a couple of pots, the pleasure of growing herbs can be yours. Broadly speaking, when planning a garden for herbs, you can choose a design that is either formal or informal. Any design is, of course, a matter of individual choice and may combine elements of the two. In a formal design, the beds are divided into sections in a clear pattern, based on geometric shapes. 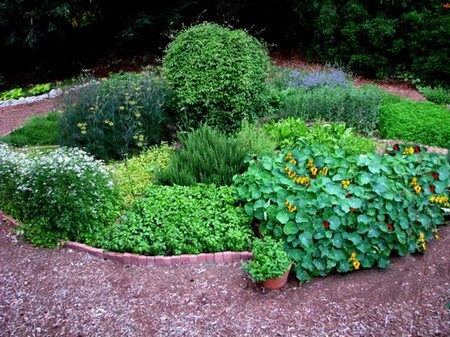 A formal herb garden can be square or rectangular — as was common in Roman times and later in medieval monastery gardens. Another option is a symmetrical arrangement of beds including shapes such as regular curves, triangles, and circles as well as squares and rectangles. Traditionally the beds are defined by hedges, paths, or low walls to provide ease of access and to confine the herbs. Beds are filled with herbs grown in clearly delineated and controlled clumps, or as blocks of one kind of herb. A traditional form of herb garden that still provides inspiration today is the knot, a twining or looping pattern of clipped low hedges. While boxwood is a traditional hedging plant for knot gardens, herbs can also be used. Rosemary, lavender, and thyme tolerate the frequent pruning required; for a more relaxed look (or to eliminate clipping) try parsley or chives. The spaces between hedges can be filled with coloured gravel or herbs, especially those with a contrasting leaf colour or texture. When planning a formal herb garden, you will find it easiest to plan the design on graph paper first, drawing the layout to scale. Transfer the design to the ground using stakes and string. Mark straight lines with string secured by stakes at either end. Draw curved lines on the ground as arcs, with a stake tied by string to another stake planted in the ground. An informal design is asymmetrical, with a more natural, less controlled arrangement of plants than in a formal design. Any paths are curving or winding. In ‘cottage garden’ style, herbs grow close together, profusely and abundantly in generous clumps, their shapes informal. Although the effect is natural looking, the herbs will have the greatest decorative effect when selected and positioned with regard to colour and form. elements, so combining beauty and utility. Annual and biennial herbs — basil, dill, chervil, coriander, and summer savory, for example — are easy to incorporate into a vegetable garden. 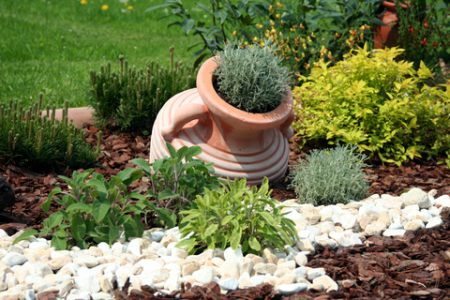 Planting herbs among vegetables or flowers can add diversity, colour, and decorative effect.